Visit of Mr. Ramesh Phatak, Vice President, R&D, Schneider Electric India to Electrical Engineering Department at Kengeri Campus of Christ University on 12th November. Mr. Phatak interacted with the staff members on how industry can be involved in academics. A brief introduction of the University and its mission and vision were also presented to Mr. Phatak. 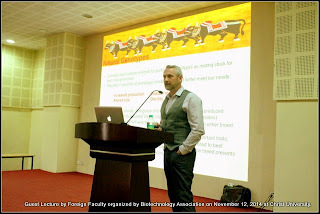 Mr. Phatak addressed the students of the Electrical and Electronics and Electronics and Communication disciplines on ‘Innovation and Technology Trends’. He stressed upon the importance of innovation in today’s scenario, its importance in building business opportunities and the importance of knowledge of multiple disciplines in innovating. 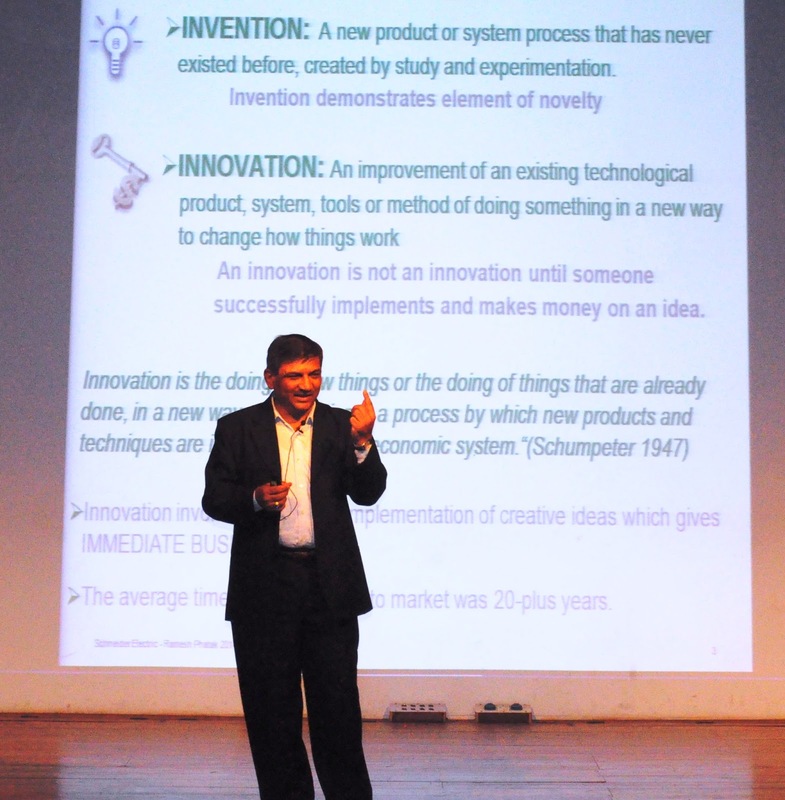 He also explained about some of the recent trends in technological innovations. Mr. Phatak was accompanied by Mr. Srinivas M.R., Manager-Power Quality Solutions and Edison Expert at Schneider Electric, India. Gateways is a most effective way of bringing students under the same platform, for tomorrow's computer folks to meet up, compete, learn and grow. Students fight it out in an array of events and activities of technical and non-technical events. It is a vibrant place where many talented students showcased their skills and abilities from past few years. 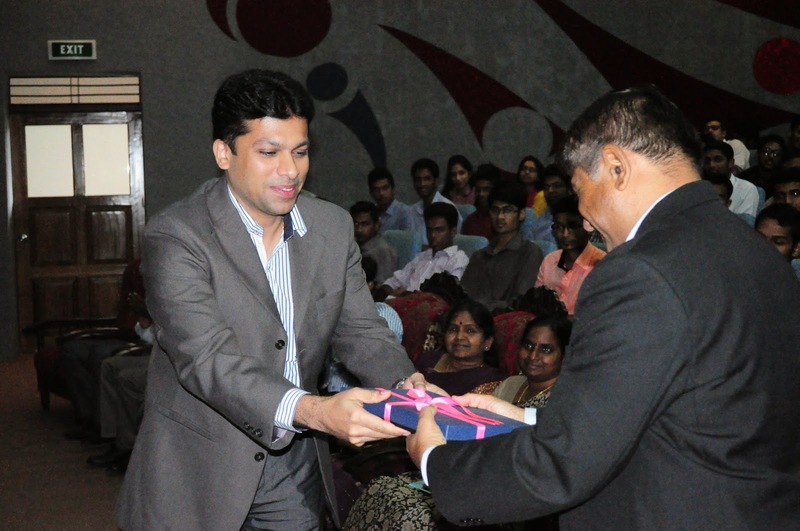 The Department of Computer Science organized national level Intercollegiate IT Fest - GATEWAYS 2014 on 9th and 10th September 2014. Coding & debugging, Web design, QUIZ, Product Launch, Best Manager, Video Making, JAM, Mock Parliament, Dumb charades, Photography, Treasure Hunt, Gaming. Infobahn – Bi-annual IT Magazine released during the Gatways. Registrar In charge and COE, Christ University. The main aim of Gateways is to benefit the students by providing needed exposure which will in turn help them to know where they stand. It also helps in maintaining a good relationship with other colleges throughout the country. 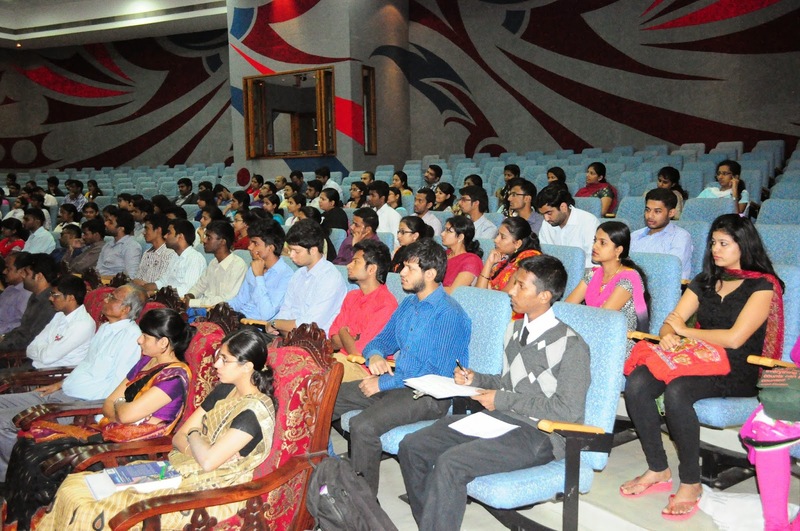 Since it's a fest organized by the students, it will help the students in developing their soft skills as well as organizational skills.Gateways-2014 ended successfully, most of the students has got excellent opportunities, participated with lot of enthusiasm and exhibited team spirit and displayed their talents. 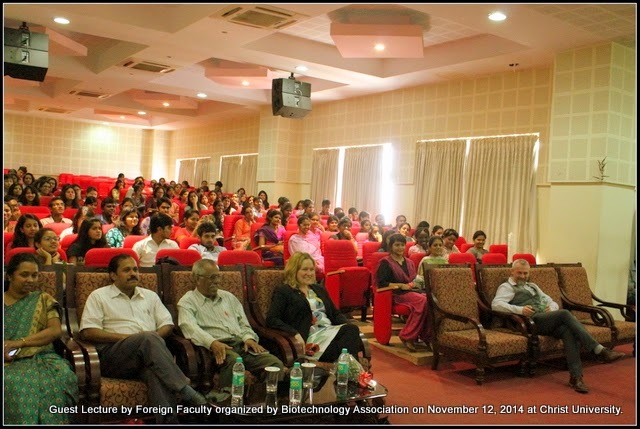 The Biotechnology Association of Christ University had organized a guest lecture by an eminent scientist from University College, Cork, Ireland on 12.11.2014 in Room No.911 in the Central Block of Christ University Main Campus. Prof. Justin V McCarthy, Director of Biotechnology, University of Cork (UCC) gave a wonderful talk on the topic “Altering the genetic blueprint: Pharming for Farmaceuticals”. He also gave the students an insight into the various opportunities for higher studies at UCC campus. 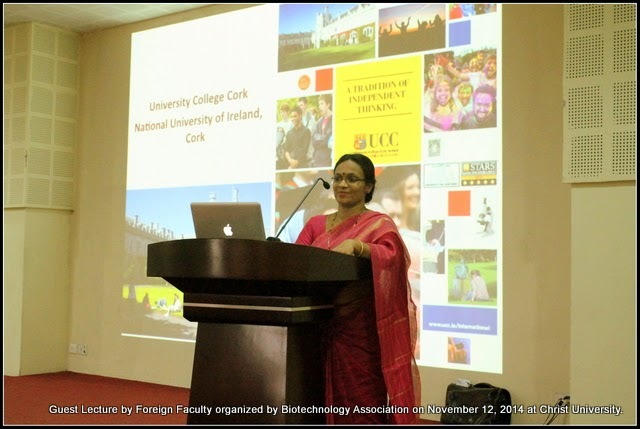 There was meeting of the faculty of Biotechnology (Dr Suma S, Dr Biljo V Joseph and Ms Vasantha V L) and Deans of Science (Dr Nanjegowda N M and Dr Louis George) with Prof. Justin V McCarthy and Prof Kellie Dean from University of Cork, Ireland regarding syllabus and opportunities for higher studies. 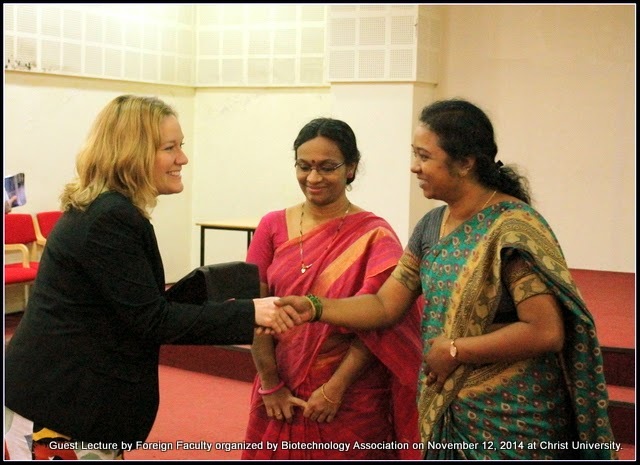 The discussion centred around possibilities of student and faculty exchange for research purposes between UCC and Christ University. Overall it was a very enriching experience.